Download Vinyl Factory Drumz 3 - Immerse yourself in part 3 of ModernBeats.com's "Vinyl Factory" Trilogy. Volume 3 delivers another superb round of classic vinyl-crate drum kits. Download 72 stompin' kicks, 60 cracklin' snares, & 60 gritty percussion sounds packed w/ vinyl flavor! 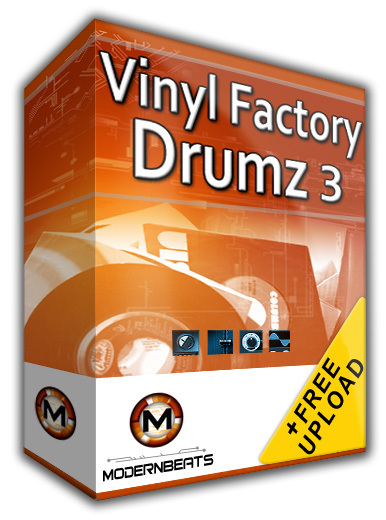 Each of the 6 drum kits contained within Vinyl Factory Drumz 3 auto-load 12 kick samples, 10 snare samples, and 10 percussion shots each into your software sampler of choice - That's 192 drum samples total! Purchase the whole "Vinyl Factory Drumz" Collection (Volumes 1, 2 & 3) and load all 216 kicks, 180 snares, and 180 percussion sounds - and be on your way up the Stairway to Vinyl!